Typical small hammock on Lee-Cypress prairie to the west of Janes Scenic Drive. Late this spring during a chance conversation with Karen Johnson at the ranger station’s newly-planted butterfly garden I was outed as a ‘cryptobiologist’. By that I don’t mean someone who goes in pursuit of mythical creatures like Sasquatch, but rather someone who has trained as biologist but never practiced as one. As Karen’s eyes lit up I could almost see the thought bubble with the word “RESOURCE” flashing in it. She quickly pounced and the next thing I knew I was meeting Park Biologist Mike Owen to discuss a couple of projects tasked by Tallahassee on his ever-growing, but completely under-resourced, ‘to-do’ list. This was the beginning of the Prairie Hammock Survey. When we think of the Fakahatchee we tend to focus on the Strand itself but there are seven main prairies within the Preserve. 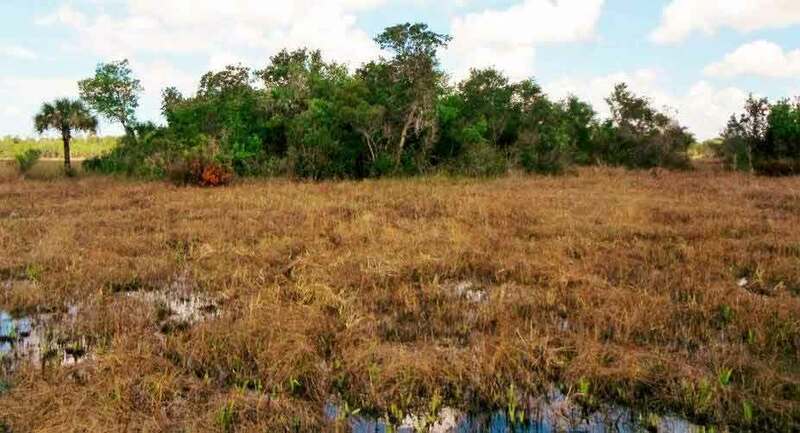 These are wet prairies – the least flooded of any Florida marsh type covered by water for only a few months of the year. They are also very species rich, even without taking into account the myriad of tree islands (hammocks) dotted across them. These develop on limestone outcrops that raise them slightly above the surrounding terrain and are mini-ecosystems in their own right. Their drier ground, abundant food supply and cover make them important resources for wildlife, but the Park does not have a lot of data on them. That’s where the Prairie Hammock Survey comes in. It will provide data for input into the Park’s Burn Zone Map. Hammocks containing oaks are of particular interest because their acorns are an important food source for white-tailed deer, which in turn are the favorite prey species of the Florida panther. Acorns are most abundant on the ground from October through December when the nutritional value of the prairies’ other plant species are at their lowest. Knowing which hammocks are important for acorn production feeds in to the Park’s panther management objectives, although acorns are also an important food for the Florida black bear, as well as wild turkey, gray and fox squirrels, mice, voles, rabbits, raccoons, opossums and foxes. The survey will help the Park identify which hammocks should be protected when the surrounding prairie is subject to rotational (prescribed) burning and will also provide a baseline for detecting and monitoring any changes in species composition over time. A typical survey day is on foot and often begins by wading waist deep across the borrow ditch after a careful check there aren’t any alligators lurking nearby. Once on the prairie during the wet season, and this is a very wet one, water is usually calf deep except in the hammock interiors where you have to be alert for other critters seeking dry feet or bellies, as the case may be. Rose Flynn has been joining me recently and adding her knowledge of the Fakahatchee. So far we’ve concentrated on Lee-Cypress, Copeland and West Prairies. When we’ve collected enough survey data we may see trends in species composition. But you only have to look at a close-up of the Park on Google Earth to see that that there are an awful lot of hammocks. It’s rather like painting the Brooklyn bridge. Each hammock is surprisingly different and brings a sense of discovery. We record its latitude and longitude, write a brief description, photograph it, measure its circumference, calculate its canopy height, do a transect, tabulate the quantity of each tree and shrub species, as well as log water depth, wildlife sightings, bromeliad and ferns present, and note nearby blooming flowers. This usually involves circumnavigating each hammock 3 or 4 times, so we cover a lot of ground, but the real time involved is getting there. Some of the prairies are quite remote and just to do one or two hammocks can take a whole day, especially when you are diverted by an interesting spider or some other natural marvel. Still, it’s a privilege to be able to tramp across such a beautiful landscape, even more so when there’s a purpose to the trek, and as a new member of the FOF Board it’s a fine opportunity to ‘learn’ the Park. Besides, there is something about open spaces and big skies that appeals to the human psyche – perhaps because mankind evolved in a similar savannah environment. Patrick carrying survey gear on the way to the prairie. 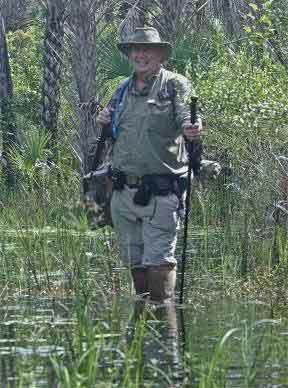 Patrick Higgins has been tromping around the Fakahatchee since 2004 and has helped with FOF Coastal Cruises and Ghost Rider tram tours as an expert interpreter. He operates his own eco-tour company, TropicBird Ecotours+.